I can't see Saint Joseph and not see my father. I can't pray to him and not think of my godfather, who is named for him. I can't write this blog post and not mention my husband, who worked in a nursery for years. Perhaps, if you're reading this, it's the same way for you: this blend of the living and the dead, the familial and the famous. The Bible doesn't give us much to work with here. He's there when Jesus is born, but gone by the time Jesus dies. This has led some to speculate that he was much older than Mary when they wed. And they wed, it should oft be repeated, even though she was already pregnant and he knew the child wasn't his. We usually say he was a carpenter. But James Martin writes that tekton, the Greek work given for Saint Joseph's profession, is better translated as "day laborer": less of a skilled tradesman, more of a general handyman. Sometimes, I like to think of him as a giustacofane, a wandering fixer of broken things, a vocation that doesn't really exist anymore. I like to think of him wandering into the homes of his devotees and fixing the things in their lives that are broken. Other times, I like to imagine him various professions: as the baker, the butcher, the men who work at the groceria across the street from our home and ask me "where you been?" whenever I get back from a trip. They know I was gone because they're there from open to close every day so they can put food on their table and several other tables back in Mexico. In Southern Italy and Sicily, he is associated with the back-breaking labor of farmers who guard the fertility of the land, just as Saint Joseph guarded Mary's fertility by caring for her during her pregnancy and childbirth. In short, I'd attribute to him any vocation that anyone has ever performed in order to care for their family. Carpenter's tools, a staff with lily blossoms. According to Catholic tradition, Saints Anne and Joachim were very picky when choosing a husband for their daughter Mary. When Saint Joseph came to court her, the staff he carried with him miraculously flowered. That was how they knew he was a worthy suitor. Most Catholics will say this was a sign of his sexual purity. I say, if you look at a man carrying a rod that performs miracles and think "He must have been a virgin! ", you are probably not going to get much out of this blog. The bastone cards in a Neapolitan deck. Do they look virginal to you? Fathers, men who care for children, workers, immigrants; prayed to for employment, real estate (most famously, his statue is buried upside-down when selling a house), against doubt, and for a happy death. Saint Joseph is celebrated as the patron of workers on May 1. The May Day celebration has ancient pagan roots and modern associations with labor rights. Many Italian American societies dedicated to the saints began as mutual benefit societies: groups of workers who would pool their resources to take care of each others' families in case of injury or death. But today, we will focus on his March 19 feast day, which has special prominence in Italy, Sicily, and Italian America. Some of the most famous altars dedicated to Saint Joseph are found in Salemi, Sicily. Men and women spend five days a week for a whole month building these ornate altars. The men build the frames and cover them in lush vegetation, including seasonal flowers and citrus fruits. The women bake breads in special shapes. All of the gold you see in the picture below is bread. It's truly breathtaking. Saint Joseph's altars typically have three levels, representing either the persons of the Holy Trinity or of the Holy Family, depending on who you ask. The large breads in the center are dedicated to the Madonna, Baby Jesus, and Saint Joseph. An altar to San Giuseppe in Salemi, Sicily. The tradition of building altars to Saint Joseph continues in Italian American communities in the United States, the most elaborate of which are found in New Orleans. A good overview of the symbolism is available here. Every year, the Archdiocese of New Orleans publishes a complete listing of the altars along with the hours they are available for public visitation. This is, to me, the radical heart of Saint Joseph's Day. Three children are chosen to play the parts of the Madonna, Jesus, and Joseph. They come to a house and knock on the door. - Jesus, Mary, and Joseph. - We seek food and shelter. - There is no room for you here. The refugees go to the next house, and the same scene repeats. So they go to a third house. Inside of this house, an altar to Saint Joseph has been prepared. - Welcome, welcome! The food is prepared and the table is set. Come in and join us! For the ancient Greeks, this concept was known as "theoxenia", and it appears in several myths in which a stranger (xenos) turns out to be a god (theos) in disguise. Laws of hospitality obliged the Greeks to welcome strangers and travelers into their homes, where they fed and sheltered. Guests, in turn, were obliged to respect their hosts and give them a gift if they had one to give. This rosary can be prayed on a standard set of rosary beads, with the posta in place of the Pater Noster at the large bead and the Grani in place of the Ave Maria on the smaller beads. At the end of the decade, pray one Pater Noster and one Ave Maria. foster virgin like the Mother. give us help, refuge, and advice. providence you must send me. of Jesus, Mary, and Joseph. the name of Jesus, Joseph, and Mary. datini aiutu, riparu e cunsigghiu. la pruvvidenza nn'aviti a mannari. di Gesu, Maria, e Giuseppi. lu Patri, lu Figghiu e lu Spiritu Santu. lu nomu di Gèsu, Giuseppi, e Maria. 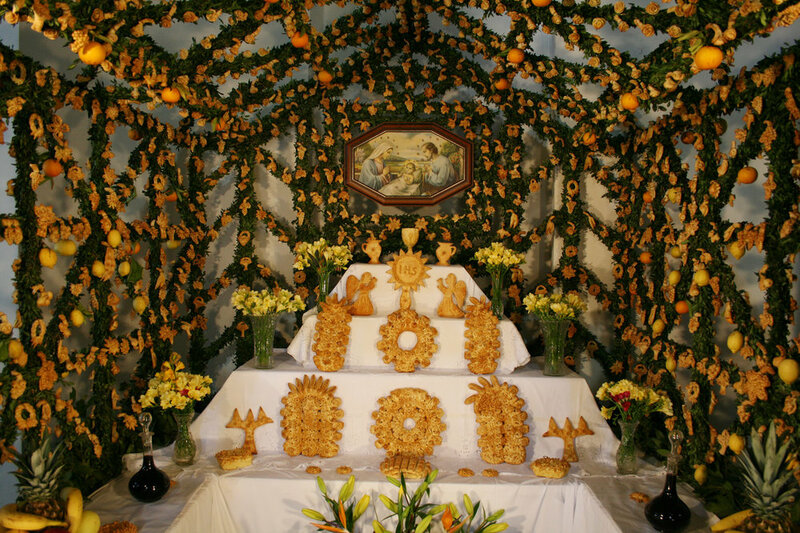 Many saints have associations with seasonal foods in Southern Italy and Sicily. Because March 19 falls within Lent, when Catholics would traditionally abstain from meat as part of the purificatory process leading up to Easter, Saint Joseph's traditional foods are vegetarian. There's an emphasis on seasonal delicacies, such as snails and sardines. It's also interesting to note that many of the foods associated with Saint Joseph in Sicily aren't indigenous to the island, but were brought there by Arabs in the 10th century. If you want to predict where political instability, revolution, coups d’etat, or interstate warfare will occur, the best factor to keep an eye on is not GDP, the human development index, or energy prices. 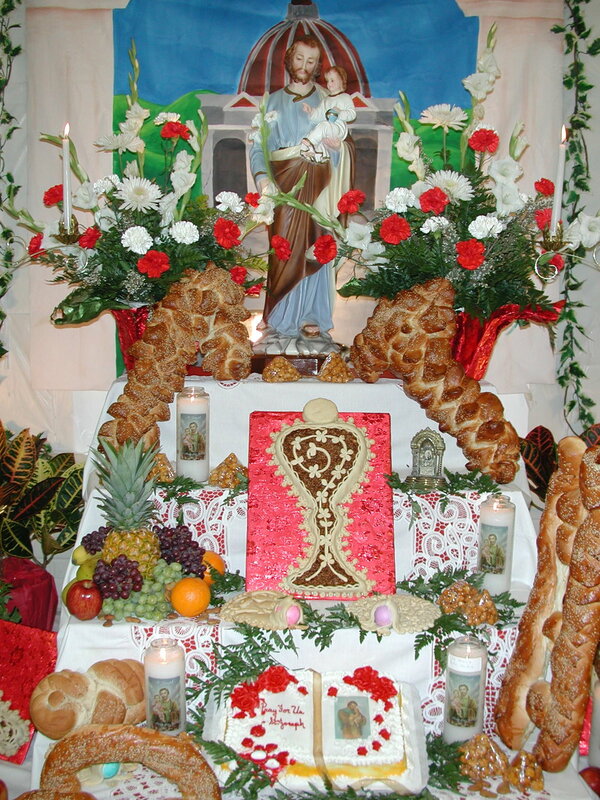 Bread is perhaps the most important element on Saint Joseph's altars, whether in Italy, Sicily, or Italian America. And this isn't just any loaf we're talking about, either. These breads come in a wide variety of shapes and sizes, often expressing something about the baker's devotion through traditional symbolism. You can make bread in honor of Saint Joseph at home. This recipe is easy and fun to make with friends and family. Even small children can join in the fun, as the dough is similar in consistency to play-doh. It can be eaten immediately or left out as a decoration. Many choose to have their bread blessed by a priest and keep it in the home the invite prosperity and stability in the coming year. Dissolve the flour, lard, salt, sugar, and yeast in half a glass of warm water. Continue to add warm water until the dough is firm. Shape the bread using the symbols you desire. Beat the egg with the lemon juice. Brush the dough with the lemon-egg mixture. Bake at 450 degrees Fahrenheit until golden brown. Sun - A symbol of the homeland, of life, of fertility, and even of God. Carpentry tools - Traditionally masculine work. Fixing broken things, building new things, tinkering with things to find out how they work or what they really are. Consider the function of each: the nail joins things together, and three nails is a shorthand for the crucifixion as much as the cross itself. The hammer applies force and breaks things apart. Pliers hold firmly, manipulate, bend, and compress. What tools do you need right now? Sewing tools - More delicate and traditionally feminine work. Storytelling through cloth. In many ancient Mediterranean cultures, textiles were the only way a woman could earn money of her own. Much of this work is safe and repetitive, making it an ideal trance induction technique. These implements figure in many fairytales. Ladder - Climbing to new heights. Reaching things that would otherwise be out of grasp. Promotions, achievements, acquisitions; taking things step by step. Staff - Vital force. Protection. Pride. Today, dried fava beans are considered "lucky". Some would say they're good for "money magic". Some carry one in their wallet, so they'll never run out of money. Some keep one in the pantry, so they'll always have food to eat. And some creative soul might even keep one in her stash box, for obvious reasons. When we look around the green world, we see so many teachers, elders, and allies. It can be tempting save time by categorizing them in broad strokes: the one is good for money magic, this one is good for love magic. But why use one love magic herb instead of another? Are they all interchangeable? Can you add every money magic herb you've heard of into a charm-bag to make it more powerful? To truly understand the way plants affect us, we must look beyond easy categories. Some money plants are prodigious multipliers, like mint. The magic and medicine of the fava bean is revealed in its myth. It is protection against disaster and hunger. It's not necessarily there for you to get a raise or a promotion. It's there as an assurance that, no matter what, you will always have something: maybe not the thing you thought you wanted, but enough to get by. That type of magic might not seem relevant to us city slickers whose wealth is stored in numbers on a screen and whose food is grown by other people in other countries. But the world is changing quickly, and if you ask me, I'd rather pass on a spiritual connection with the humble fava bean to my children. Cook the fava beans in boiling water until tender, adding more water as needed. During cooking, sauté seasoning in olive oil until tender; add to beans. Season with salt and pepper to taste. Serve hot in a soup bowl. Two classic pastries are baked in honor of San Giuseppe. But which is the zeppole, and which is the sfinge? That is a question for the ages, a subject of intense and heated debate among Italian Americans. At my local Sicilian bakery, we call the smaller pastry on the left--a puff pastry filled with cannoli cream--a sfinge, and the larger pastry on the right--filled custard cream--a zeppole. Others would say the exact opposite. To make matters more complicated, some people use the terms interchangeably, and the fried dough balls sold at feste are often called zeppoli. Follow your heart on this matter.